"Every rose has its revolution," one says. "It’s not like the T-shirt is going to stop harassment," she says. But it's "a reminder that you are part of something bigger that is working to empower women and to give back in some way and that is trying to have this conversation that challenges all of these structures which we are victims of too", she adds. She donates around 10 percent of her fashion earnings to a local women's group. Jackets are sewn in Hassan Shehada's Gaza workshop. 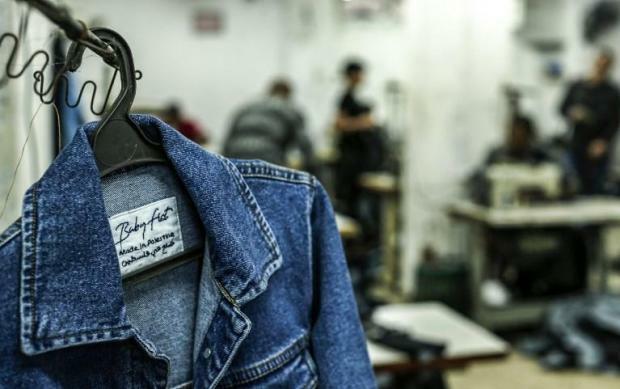 Among the sewing machines humming under florescent lights, Shehada shows a denim jacket embroidered with "Not your habibti". It was a breath of fresh air for Shehada's business in the Gaza Strip, under an Israeli blockade for more than a decade and with endemic high unemployment. Mjalli has come under fire from conservatives, who say she draws attention to women's bodies by designing clothes that carry provocative messages. For Mjalli, there have been "already two or three generations of women that have had to suffer while we say: ‘OK, you can wait.'"